To many, accountability means meeting your commitments in the eyes of others. For high performers, however, this is only a small part of what accountability really means. Henry Evans, Invited Agitator and Key Peacemaker for the C-Suite, joins me on this episode of The TalentGrow Show to define accountability for high performers, identify common mistakes many leaders make, and teach you how to ‘Win with Accountability’ (after all, that’s in the title of two of his books!) You’ll learn about the pitfalls of over-commitment and poor vertical communication, why it’s important not to externalize problems that arise in your organization, and how we as leaders can promote an atmosphere of safety in which our team feels comfortable discussing and learning from mistakes. Plus, find out why you should always strive to include people who are different from you in your business planning. Henry is full of actionable advice for leaders, so don’t miss this one! Listen and share what you learned with others. Henry is an Invited Agitator & Chief Peacemaker to the C-Suite. As CEO (Change Excellence Officer) for Dynamic Results, an Amazon Top-10 author and global speaker, he’s delivered 11,000 hours of Executive Coaching in the C-Suite and 3000 hours of Change Management/Strategic Implementation services. Henry’s firm, Dynamic Results, was awarded the 2018 Brandon Hall Award for Excellence In Learning (the only boutique firm to win a medal) for their Accountability eSchool. As a five time CEO with one failure under his belt, Henry smashes myths about high performance leadership. Halelly: Hey, hey, welcome back TalentGrowers. This is Halelly Azulay, I’m your leadership development strategist here at TalentGrow and this is the TalentGrow Show. 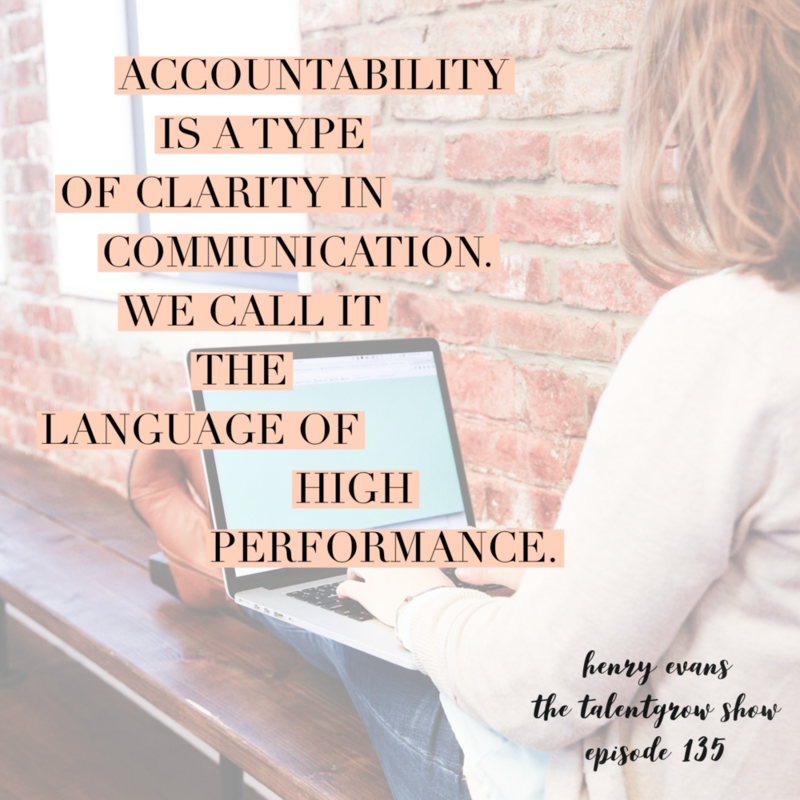 This week we have a guest who is a colleague of mine, Henry Evans, and our conversation meanders around the topics of accountability and emotional safety. Those are two very interesting, different but intertwined topics, and Henry shares some super specific ideas about why accountability is important, how we’ve been defining it wrong – many of us – what leaders can do to engender more accountability, and some interesting concepts around how we might be creating a bubble for ourselves if we’re not careful and how to create more emotional or psychological safety in our organization, on our team, and preventing us from making terrible mistakes. I hope you enjoy it. By the way, today, as we are releasing this episode, it is Henry’s birthday, so join me in wishing Henry a very, very happy birthday. Happy birthday Henry! Here we go. Okay TalentGrowers, this week we have Henry Evans on the show. Henry is an invited agitator and chief peacemaker to the C suite. These are words he uses of course and very interesting, and he also is CEO for Dynamic Results and he says CEO is Change Excellence Officer. He’s an Amazon top-10 author and global speaker. He’s delivered 11,000 hours of executive coaching in the C suite, and 3,000 hours of change management and strategic implementation services. Henry’s firm, Dynamic Results, was awarded the 2018 Brandon Hall award for excellence in learning for their accountability e-school. They were the only boutique firm to win this medal, and as a five-time CEO with one failure under his belt, Henry smashes myths about high-performance leadership. Henry and I met at a couple of conferences of an organization we were both members of, and so it’s my pleasure to ask and have Henry on the TalentGrow Show. Henry, welcome. Henry: Thanks, it’s great to be here. Halelly: I’m really glad that you’re here. Before we get into this topic of accountability, I always ask my guests to describe their professional journey briefly. Where did you start and how did you get to where you are today? Henry: I would probably go back to a scholarship I was awarded. My family did not have any money to speak of, growing up in Brooklyn, and I was given a scholarship to this formal assessment institute, mostly for children of the wealthy. They basically study what you’re good at and what you’re not and they tell you what you should or should not pursue doing later in life. Due to a chronic stutter, one of the things they said I should not do is anything involving leadership or public speaking. So I was given that feedback at 10, and by the time I was about 20 I was going through the recruitment process with the FBI and was in stage two of that process, pretty close, when my first angel investor kind of stumbled into my life and I threw a business plan in front of him. He funded my first company and kind of became a serial CEO after that. Halelly: That’s very intriguing and I want to ask you a follow-up question, even though I don’t usually. You’re going to be an FBI agent and then someone throws money at you and you throw a business plan at them. I know you were going the brief version, but I want to know more about this one. How did that happen? Henry: I had taken on a mentor, or a mentor took me on and started to teach me some process consulting, and I went to work for a very small business in the southwest that was failing. I started to turn that business around and improve their customer service ratings, so they had a client who was also an angel investor in companies and as I would meet him, he would tell me about his investments and I was just in parallel, running this small business as a consultant and interviewing with the FBI. When this angel investor kept talking about the benefits of using other people’s money to start a company, I thought, “The FBI is an opportunity that will be there again. I don’t know if I’m going to fall across an angel investor who would invest in a 20-year-old,” so I put together a business plan and presented it to him and he decided to back me. Halelly: That’s very cool. Kudos on having the guts to go for it and that set you up on a totally different path then, huh? Henry: That has happened a few times in life, yes. That is I think one of the things that keeps me agile when working with clients, having survived these shifts in my life that seemed, at some times, insurmountable, and having come out of them okay, I tend to carry a positive bias into our clients’ challenges when they’re feeling overwhelmed. Halelly: You’ve written three different books and Amazon top-10 author. That’s a pretty cool title to have. A couple of your books are all about accountability and this is a topic that comes up actually a good bit for me, even. I also teach about accountability to some of my clients and sometimes it baffles me that we need to talk about it and explain it to people. How do you define accountability? And why do you think it’s such a struggle for so many leaders, teams, organizations? Henry: We describe, at least our accountability method, and our approach to accountability, as being intellectually simple and behaviorally complex. So I think you alluded to it. It’s kind of common sense but it’s not common in practice. I think organizations and leaders struggle with it for a number of reasons. One is that we’ve all been taught that accountability is a punitive concept, so most people think about accountability as what you apply after a relationship or project has failed. That is almost the antithesis of how we introduce it to systems and organizations and certainly how we want to leave them. We want to leave them with a perception that runs vertically, from the CEO’s office down to a manufacturing floor. The accountability is a type of clarity and communication. We call it the language of high performance. The people that are using it are making and requesting commitments so that they get better outcomes, and not just business outcomes. Not just the hard targets and metrics, but also the engagement and enjoyment of the workforce. Halelly: You think it’s a struggle because people view it as punitive or that they’re defining it wrong? Why is it hard to get? I guess I’ll back up. You and I – I think – share something because we’re business owners, that many of the listeners probably share because they’re leaders, which is we’re high performers, we’re self motivated, we’re driven, and we kind of get it. Like if you’re going to do something, you’re going to do your best, and if you’re going to commit to something then you’re going to follow through on your commitments. I think that most high achieving people totally get that and probably just kind of come with that baked in. It’s sometimes almost shocking or surprising to encounter that this is not something that is characteristic of everyone in the workforce. What gest in the way? Henry: We wrote about this a lot in one of the other books, Step Up, and it’s simply that people like you and I, and I do believe we have this in common, even energetically. We approach this interview with the intention of benefiting people and presenting impactful content that will help them do better at whatever they’re doing. And you and I can’t imagine why somebody wouldn’t carry that same kind of intention. So, the industrial psychologists I work with in our firm would say that people think that people who think like they do are smart people. So you and I think that people who are going to put their best foot forward, always bring their A game, are the best kinds of people to work with. People with a positive bias. But people like you and I that have had an adventure – and I take the risk of speaking for both of us. Halelly: Go for it, since I did! So one of the mindset shifts we want to make, and now I think I’m finally answering one of your earlier questions – how do we define it? – is that people and organizations start to think about accountability as meaning exactly this: clear commitments which in the eyes of the others have been kept. The context that I’m at is that when we’re talking about self-development we say, “You have to be introspective. You have to be self reflective,” which I strongly endorse, as does our team. But when you’re trying to build accountability in an organization, our self-assessment is almost irrelevant. The assessment of our stakeholders, coworkers, customers, vendors, that’s whose opinion matters because that is how the world deals with us, based on what they think. So we try to help organizations figure out what is it your key stakeholders want from you, how are they likely to measure it, and how are you going to exceed those expectations? We don’t rely on self-assessment. Halelly: Because it’s ultimately, if you’re in business, you’re delivering some kind of value, some kind of result to someone else, and so it’s in their eyes whether you delivered it or not. Henry: Yes, and we work with different kinds of people and I’m sure you interview different kinds of people and there’s a great bell curve listening to us right now. You have some people – if I speak in the extremes – who are capitalists and they’re motivated by metrics and targets. It might be making money, it might be EBITDA, but they’re driven by hard facts. And then you have people that are more altruistic and want to create beautiful and engaging cultures, where people enjoy doing great work and a great place to work. When it comes generating accountability, we don’t really care what your motivations are, because you get both results when you do it properly. You get higher performance and people are more engaged in the work and one of the reasons for that is you create this kind of radical clarity in the organization about what’s expected, so you have fewer disappointments, fewer missed deadlines, and you start to outperform your competition as a byproduct of these shifts. Halelly: Okay, so greater clarity sounds like a very strong theme. What are some mistakes or how can we do this better and avoid the mistakes that many leaders are making as they approach facilitating accountability on their teams? Henry: I think there’s a lot of finger pointing in the organizations we work with, when we first get in. And one of the ways fingers are pointed is in the way your question is crafted – what are leaders doing wrong? But when accountability is missing, it is not missing solely because of the leadership. It tends to be missing in all directions. Leaders might be at the source, and we do think culture is shaped top-down, but the biggest mistake that people in an organization make is externalizing their frustrations so they’re blaming all the stupid people around them for their undesired outcomes. That sounds like people saying, “Our leaders don’t know what they’re doing,” or “Our employees don’t know how to follow a plan,” or “Stupid customers keep changing requirements on us.” And as long as we’re externalizing, while experiencing undesired outcomes, we’re operating in an extremely unaccountable way. And a more accountable way of speaking in those same situations might be to say, “How am I personally contributing to this undesired outcome?” Or “What is it that I failed to communicate up front that had I communicated it would have given us a much better outcome?” For those of you listening who might be introverts, your silence is what could be deadly in the organization. It could be that you saw the obstacle coming or you saw the roadblock coming, but for some reason you didn’t feel emotionally safe offering your observation or concern, and so by being silent, you allowed the organization or a team to drive off of a cliff. Halelly: That by itself we could probably talk about for a while episode another time, that fear of speaking up and being a whistle blower or a naysayer is a big problem for a lot of cultures. Henry: And that ended up being the summary of five years of PhD research on high-performing people in organizations, so we identified all these high performing behaviors that those leaders have, but they were all built on a foundation of what we call emotional safety. We could have a whole other conversation about it. It’s the summary of another book and it’s an entire training program. Halelly: Let’s come back and do that another time. Let’s keep talking about accountability. You now came out with a book most recently, co-authored by you and our colleague and mutual friend Elaine Biech and it’s called 131 Ways to Win With Accountability. I don’t have 131 minutes or however long it’ll take in this podcast, so I’m going to challenge you to just choose two or three to share with us and whatever criteria for a selection you want to use, like your most favorite ones or the most unexpected or unusual ones or the easiest ones. Tell us a couple. Henry: Before I do, can I just give you two other big mistakes that people make? In one sentence each? Overcommitting. We provide a system for down-selecting what an organization is critical so they can actually focus on what is most critical of the critical. And then change management communication, or to put into plain English, communication. How these objectives are communicated vertically in the organization is usually bad. However good or bad it is, at the top, it gets worse as we go down the org chart, so it really has to be excellent at the top. Halelly: Because it’s like a game of broken telephone. One person passes it to the next, passes it to the next, and it becomes morphed. Henry: And to this next question, what my top two or three are, I would in a sense struggle to pick two or three only because we broke them into different categories. They might be broken, one chapter is about how you run an accountable meeting, and another is about having an accountable performance management discussion. But, I know some of Elaine’s favorites, and I try to pick people that are smarter than I am to write books with, so I’m going to go with a few that I know that she likes. Henry: One of them is when you’re putting together a plan. I think in the book this is number one of 131. Make sure that every work effort has a clear visual association for all parties involved. All key stakeholders. Another way of saying that is you have to paint a picture of your desired outcome that everyone can see. For instance, instead of saying, “Give me a report on sales,” you might say, “Please give me a three-slide power point deck that shows the year to date sales for each of our three regions. One per slide, with a map illustrating the region you’re reporting on.” Now people have something they can visualize and the chances of the miscommunication or disappointment are greatly reduced. Henry: I think number 35, introducing our language of accountability on day one of a new hire’s experience in your organization. We have clients, and most of our best practices come from our clients in this book because they take our ideas and they make them better. They will introduce our accountability method and the associated language during the on-boarding session prior to the first day of employment, so they’ll say, “This is how we make a request, whether it’s in email or spoken word in this organization. Here’s what a promise sounds like in our organization.” So they’re kind of giving new hires the roadmap for how to speak in order to be perceived as a high performer in that system. Halelly: It’s like a lexicon or the language of this organization. Henry: Yes. And our clients tend to lead in their sectors, and they lead not necessarily because they have shinier buildings or better or faster processors in their laptops. It’s more the way they speak when they’re making or requesting commitments, which brings me to another one. Number 116. Making it safe for other people when something goes wrong, and that’s often done by being vulnerable. You lead with how you contributed to an undesired outcome, not with how your team did. I try to think of an example for you and we have a client that just did a brilliant job. They just lost a major client, and the team was devastated and also afraid to meet with her. And she started the meeting with, “Well, it looks like this plan that I imposed on us lost us a very important client. I’m sorry. I want to learn how we can collaborate and do better next time.” This kind of sucked all the tension out of the room and it left her team ready to brainstorm in a more collaborative way. Halelly: I really like that. It reminds me of another episode I did, my guest was a former Israeli fighter pilot, Ofir Paldi, and he was describing also the methodology that was initially used by the Israeli Air Force that he’s now teaching businesses for now to, like after action kind of reflections on failures and mistakes, where the leader starts with what they did wrong. Whatever part of the mistake they own, even if it’s an infinitesimal part, and everybody can talk about mistakes in a way that’s free from judgment and the idea is to learn from those mistakes and to think about what can we do differently in the future based on this learning. So that idea of creating a learning loop in your organization and removing the fear of admitting mistakes because you’re showing leadership in doing it first. So it sounds very aligned. Henry: Absolutely. I learned this from martial arts coaches, as a competitive martial artist, but they said if you lose a match, it is not a failure if you can extract a learning from it. A loss is a failure if you don’t improve your position the next time you’re in that same situation. There just has to be a learning. Halelly: Nice. Really consciously taking out the learning. Earlier I said that we would talk about the psychological safety a whole other time, but you just mentioned in one of the tips that you chose, so can you give us a high level understanding of what this emotional safety, as you call it, or psychological safety entails? And why leaders should care more about it? Henry: When we published the emotional safety content, we just found that no matter how much of a Type A, the high performers we studied, we didn’t just study people in companies. We studied the U.S. Marines. We studied the Jesuit Order. We studied any organization that had a reputation that’s best in class. And we found that no matter how assertive these personalities were, they still created something we called emotional safety, which is if people felt safe and if they were really good at generating emotional safety, rewarded and encouraged for bringing that leader bad news. So a way of looking at it is let’s say that you’re the great leader who is really good at generating emotional safety and then your people are giving you enough real-time information that when you make a decision, you’re fully informed. Now I’m your peer. I’ve got the same amount of authority and responsibility that you have, but I’m also ignorant in my decision making, because my people are afraid to bring me that same data, based on me having given them a bad experience. So when you make your decision, it’s more likely to be reliable and good, and I actually become more dangerous to the organization because I’m using my authority in a state of ignorance. Halelly: Yes. Naturally every person has blind spots, and especially people at the top, because the people that are on the ground or on the front lines are the ones that have much more information and access to places where there’s risk and if they don’t communicate that to you, then you’re missing really important information that can prevent you from guiding everyone to run right off of a cliff. Henry: Yes. Your title doesn’t change. You still have that authority and responsibility, but instead of being an asset to the organization, you become a liability. Because you’re using the power of that authority and responsibility without the data you need to do it at the highest level. Halelly: What would be your number one tip for leaders to create more emotional safety? Henry: The number one, I think we’ve touched on, but we have 10 of them in the training. It is to be vulnerable when something has gone wrong. To lead your team with how you contributed. If you were to read my profile, or my bio, online, you’ll see I talk about a business failure I had in my first paragraph. That’s a credential. Occasionally I’ve had a prospective client say, “I know you’re trying to get us to hire you. Why did you put a business failure in the first paragraph of your bio?” Well, that was my MBA. I learned more from taking that one company through a re-org than I did from the other four that I founded in group, and I learned what not to do. You really don’t learn what not to do when you’re always winning. You learn that when you’ve hit a challenge. Henry: I love that saying. I haven’t heard it said that way, but I’m going to steal it. Halelly: All right. Well, Henry, this has been fun and interesting and we are coming close to the end, so you’re going to share one specific action. But before you do that, what’s new and exciting on your horizon? What project or discovery has your attention these days? Henry: Well, this week in particular, we are about to launch the emotional safety e-school. We’ve been working on that for a year and the first clients are going live with that next week, so that’s one thing. Henry: We’re about to start a two-year transformational change journey with the top 200 leaders of a multi-billion dollar organization, but we’re ultimately over the two years going to train about 2,000 of them. Halelly: Wow. And you called it what? A transformational journey? Henry: It’s a transformational change journey, so we’re taking an organization that is very big, very profitable, but also very stuck in old ways of thinking. Their industry is being disrupted and they’re very slow to respond and act in a new way and our job is to radically transform the way that they make decisions and implement them so they can be more competitive in two years. Halelly: Wow. Can you give us any clues about some of the things that you’ll be doing to help them with that? Henry: Sure. We’re doing behavior assessment and development on the top 200 leaders. We’re training both the accountability and the emotional safety methodologies across the 2,000. We’re also going to help them down select what it is they’re going to work on. We’re going to help them make decisions faster, so right now they tend to wait for perfect plans. And we’re going to encourage them to collect about 60 or 70 percent of the data that they think they need, make a decision and start executing faster than their competitors do and just modify and adjust as they go. And part of the logic behind that is you might think you have a perfect plan, but then life happens and you find out it wasn’t, so why wait until you have one? Halelly: Well, that’s really smart. Exactly, you can’t have it perfect because there is no such thing, and in this world, it’s increasingly changing, so even if you did have perfect, it only was perfect that moment and things have changed since. Henry: I think you get it. Halelly: Very cool. That’s exciting. Good luck with both of those initiatives and definitely let us know how it went. What’s one specific action that listeners can take today, tomorrow, this week, that can help them upgrade their leadership skills? Henry: I would actually apply this best practice not just in business, but if you’re in the United States or in Great Britain, in your social and political climate as well. It’s invite someone who thinks differently than you do to an important planning conversation or any kind of important dialogue and deeply, actively listen to what they’re saying. The example I gave you earlier, if you have a positive bias and think you can win every battle, you could be overlooking some obstacles that another person can see. It can also be if you carry a certain perception about who should be or shouldn’t be in a position of power. You’re never going to resolve the conflict between these two ways of thinking if you’re not listening to the other side. Invite people from the other side into your conversation. Try and learn why they feel and think the way that they do. Halelly: That’s great advice. Do you have a suggestion? How do you teach someone to listen to that kind of very contrarian view without judgment? What do you do? Halelly: Separate the person from the idea. I like that. So, Henry, I know people are going to want to keep in touch with you and learn more from you and about you. What’s the best way to do that? Henry: You can always contact us by email at moreinfo@dynamicresults.com. You can follow me on Twitter, @HenryJEvans. You can take our complimentary online accountability challenge, which is a free mini e-school, or buy the books, follow our blog on the website. We publish a two- to three-minute business video with a best practice once a month, and it’s complimentary. That’s all that comes to mind. Halelly: That’s great. It’s a lot. Your website is very rich with free content and so I will link to that and your books in the show notes and encourage everybody to learn more from you. Thanks for taking time from your busy schedule and stopping by and sharing your insights with the TalentGrowers. We appreciate you. Henry: It was a pleasure and honor to be on. I listen to the podcast and encourage our team, our associates, to do it as well. Just last night encouraged a former coaching client who is an executive at Twitter to tune in. Halelly: That’s very cool. That’s and interesting coincidence because I batch my interviews and then release them weekly, so just earlier today, I interviewed a former Twitter executive. How’s that for funny? Halelly: Maybe they’ll catch that one and be like, “I know her!” Very cool. Thank you, I appreciate that very much. That means a lot to me. As you know I do this as a labor of love. No one pays me to put on a podcast. I pay to put on a podcast, but I love doing it and it’s because I hope that it adds value. Knowing that someone like you finds it valuable and shares it with others, it means the world to me. Thanks Henry. Halelly: Well, there you have it for another episode TalentGrowers. I hope that you enjoyed Henry’s perspective and learned a lot from him. I sure did, and I would love to hear what you thought and your feedback. I am on a learning journey, so feedback is really important for me and it helps me improve the show for you. Definitely reach out and let me know what feedback you have for me. And, ideas and suggestions for a future episode, topics, future episode guests, are always welcome. I also hope that you are already connected with me via my weekly newsletter and that you have downloaded the free guide that I’ve created, which is the “10 mistakes that leaders make and how to avoid them.” It is completely free. It is completely yours. All you have to do is go over to the show notes page on my website, TalentGrow.com/podcast and fill in your email address and I will send you that free guide and then I will send you a weekly reminder about the new episode that’s coming out, what’s coming up the next week, helpful tips, learning opportunities and it’s very short and informal. I look forward to staying in touch. Thanks for listening. I’m Halelly Azulay, your leadership development strategist here at TalentGrow and this is the TalentGrow Show. Until the next time, make today great.